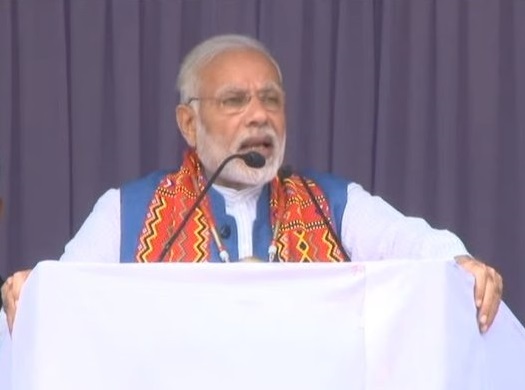 While protest against the controversial Citizenship (Amendment) Bill is intensified in Assam and other states of Northeast, Prime Minister Narendra Modi on Saturday urged West Bengal’s ruling Trinamool Congress to support the Bill in Parliament. “After the country was divided during independence, thousands of people including the Hindus, Sikhs, Christians and Parsis had to take shelter in India due to communal violence,” he said. “After seeing the crowds and the enthusiastic scenes, I understand why didi (elder sister — as Banerjee is affectionately called) is resorting to violence,” Modi said. “This is your love, which has scared those who are doing drama of saving democracy and are bent on killing innocent people,” he added.